Honeywell HE105A1000 12GPD small bypass humidifier with H8908 manual humidistat. Suitable for homes up to 16,000 cubic feet in size. Enhance, protect and maintain your home’s most comfortable humidity level with a Honeywell Whole-house Humidifier. Proper humidity provides a more comfortable living environment at a lower temperature, so you can turn down your thermostat for energy savings. 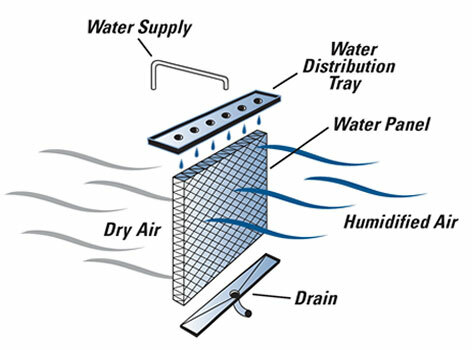 Controlling humidity also means moisturizing dry air to prevent damage to hardwood floors and woodwork while preventing excess moisture. Dimensions 18.30 × 17.11 × 9.59 in. Duct Opening 12 5/8 in. x 9 3/4 in. 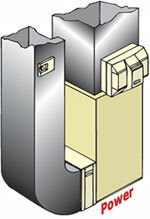 The term By-Pass or Power refers to the driving force behind the air flow. The Fan-Power humidifier uses a fan to draw the air thru the humidifier. 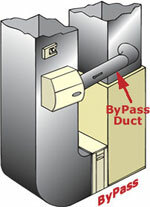 The ByPass humidifier uses a 6" diameter duct that connects the supply to the return duct. 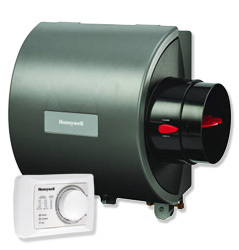 The Honeywell warranty for the HE105A humidifier is 3 years. Our customers simply ship us the defective part. We inspect and test and confirm defective. We then ship back a brand new part.